You'll be £19.99 closer to your next £10.00 credit when you purchase Blood and Iron. What's this? Until now Hugh Butterworth was just one of the millions of lost soldiers of the Great War, and the extraordinary letters he sent home from the Western Front have been largely forgotten. But, after more than ninety years of obscurity, these letters, which describe his experience of war in poignant detail, have been rediscovered, and they are published here in full. They are a moving, intensely personal and beautifully written record by an articulate and observant man who witnessed at first hand one of the darkest episodes in European history. life a dedicated and much-loved schoolmaster and a gifted cricketer, who served with distinction as an officer in the Rifle Brigade from the spring of 1915. His letters give us a telling insight into the thoughts and reactions of a highly educated, sensitive and perceptive individual confronted by the horrors of modern warfare. Butterworth was killed on the Bellewaarde Ridge near Ypres on 25 September 1915 during one of the disastrous diversionary attacks launched to distract German attention from the Battle of Loos, and his last letter was written on the eve of the action in which he died. For this full edition of his letters Jon Cooksey has edited and illustrated the text and provided an introduction, describing Butterworth's family background, his pre-war career, the battles on the Western Front in which he took part, and the final engagement in which he lost his life. The letters themselves are wonderful: well written, insightful, intelligent and amusing. As such it is a credit to Cooksey's own writing style that the qualities of his subject's prose have not left him embarassed. Jon Cooksey has produced a splendid work and produced a detailed account of the build up to the attack, the assault itself and the aftermath. This book was an absolute pleasure to read thanks to Jon Cooksey's well written narrative and they way he uses Butterworth's extraordinary letters to tell his story. Based upon the remarkable letters written from the trenches by Hugh Butterworth, a British officer who was killed during a diversionary attack on Bellewaarde Ridge in the Ypres Salient on the 25th September 1915. 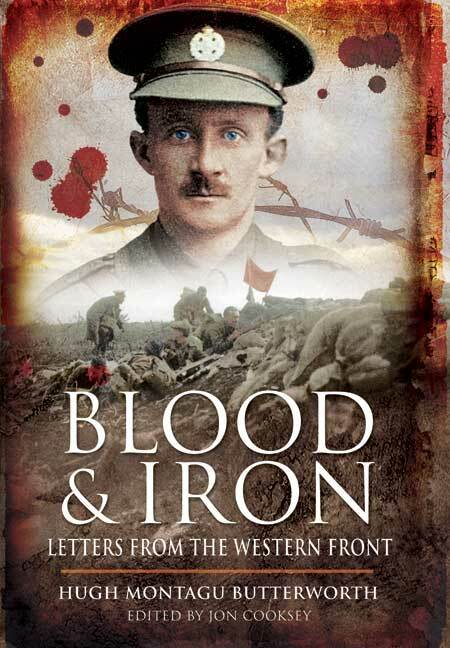 Blood & Iron traces Butterworth's life, from his pre-war days in New Zealand, where he was a schoolmaster and a talented cricketer, to his final hours taking part in the courageous but ultimately disastrous attack by the 9th Battalion The Rifle Brigade. Although it cannot be known how Butterworth met his fate, Jon Cooksey vividly reconstructs the events of that day and describes the savage and unforgiving carnage that unfolded as the Battalion succeeded in taking its objectives, only to be evicted from them by a series of fierce and relentless counter-attacks, suffering 90% casualties as they were driven back to their start point. All of Butterworth's letters are reprinted as an appendix, describing life on the front line in unfettered detail and occasionally with humour, but his final, intensely poignant despatches are the words of a man who is certain but seemingly at ease with the belief that he only has hours to live. Most highly recommended. The full story of Hugh Butterworth's war, as recounted in his own words in his letters, had not been heard for many decades. But now, in a new book containing the complete text of his letters, and carrying a Foreword by His Royal Highness The Earl of Wessex, historian, author and broadcaster Jon Cooksey has edited and illustrated the text and provided an introduction describing Butterworth's family background, his pre-war career, the battles on the Western Front in which he took part, and the final engagement in which he lost his life. This book is a valuable addition to the story of the great war, but it is also a very human story that delights, saddens, uplifts, and challenges. This affordable book has been produced with quality and attention to detail.